So…the first 4 questions are relatively simple and easy enough to answer depending on how good your memory is…but from here on it starts getting really hard to answer. Say what? All time favorite? Let me paraphrase Drew Barrymore in Ever After – it’s like asking to choose a star in the heavens to try to nail down just one drama. I could say Hana Yori Dango…but I hate being redundant and even though I really do love it…can I call it my all time favorite? I keep going back and forth and listing and relisting the many dramas I have watched (I can actually recall watching that is) in my 6 years watching Asian dramas and I am just not happy on settling on one particular drama. I am not quite sure why that is. Why is it so hard to choose a favorite? Has no drama been able to come that near and dear to my heart or is it just my lack of wanting to point to any one thing and say “Yes, this is by far my favorite”? So after much grumbling and complaining and whining, I have officially decided to choose **drumroll** the 2009 Korean drama Shining Inheritance (you might also know it as Brilliant Legacy). This was my introduction to Han Hyo Joo, Lee Seung Gi, Moon Chae Won, Kim Mi Sook, and Bae Soo Bin and the ever popular Cinderella story mixed with melodramatic angst. I think this might have been the first drama I actually watched as it was airing (either that or the cute and cheesy Atashinchi no Danshi). Normally, I only watched dramas that had already been completed, so it was a new experience to anxiously await the good folks at Viki to upload and translate the latest episodes. I loved this drama so much I actually forked over the money to buy the complete DVD set complete with Hwannie’s smiley face pins. If you watched the drama, you know what pins I’m talking about. 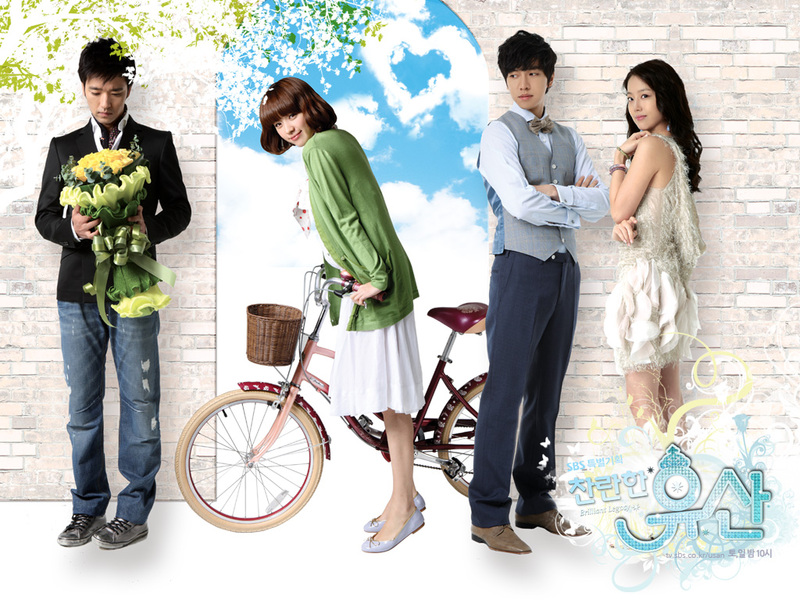 Are Korean dramas better than Japanese? That’s my reaction when you posted this part of the Drama challenge. I’m more of a movie lover, but has many opportunities to watch both Japanese and Korean dramas – my cousin used to watch 5 Korean dramas a night, and I can’t help myself but watch them too. I enjoyed them immensely – sleek production, amazing acting, good story. But I’ve decided I’m more of a Japanese movie/drama fan than anything else. I’m not saying pointedly that Korean productions are inferior, it’s just a matter of preference…. I’d love to get at least 5 more titles so that I can explore more of the amazing Korean dramas. I think Korean dramas can have a bigger budget making them grander on scale…but Korean dramas do have lots of pitfalls in plot with that the script is being written as the drama airs and I think that leads to some pacing problems and less than satisfactory endings…especially with drama extensions. I don’t know if you have noticed, but on this site…There’s a LOT more Japanese dramas recapped than Korean 😛 I’ve completed more Japanese dramas than anything, too. I guess…just because it was Japanese anime and manga that led me to Japanese drama, I watch more of that than anything else. I neither like one country’s dramas more so than the other. Each has their good points and each has their bad. You made a good point there about the budget – that’s why the production is very sleek – the furniture, the clothes, even the car and the houses! 🙂 I watched and finished one good Korean drama starring that cool guy from Boys over Flower where his character was misunderstood as ‘gay’ and gets to live in the heroine’s house – he’s an Architect. Forgot the title but it was good. I never had the chance to really explore manga and now I’m regretting it…. Ah! Personal Preference/Personal Taste. A good drama. Yeppers. I did recap that one 😛 when I first started recapping dramas. It’s never too late to start on manga 🙂 I was a bookworm long before I was a drama addict. I devoured 1000 page novels in less than a week and finished manga series (short ones) in a single day. Now…I don’t read nearly like I should any more. I loved Ban Hyo Jung, too (Hwannie’s Grandmother). But currently, in “I Summon You, Gold!”, she is playing one of those interfering, infuriating despicable Mother In Laws! She’s doing a good job, ’cause every time she’s on, I have to FF (like with LSS’s mom on YTBLSS). I just watched this show a couple of weeks ago. Marathoned it in a weekend, phew. It’s a long series to marathon, I can tell you! But i loved it. I totally agree with you about everything. It could have dragged a lot more than it did, especially because it was given an extension. But it didn’t. I never found myself being bored by any situation, or wanting it to hurry up and finish. The grandmother was so unique to Korean dramas. You never see a grandmother like that, who will put her ideals and her employees over her children because her children are freaking selfish lazy buggers. And i thought Hwan’s progress over the series was done at a really good pace. I never felt like he went from bad kid to good kid in like, a second. Hwan’s mum changed quite organically too, because she changes enough that we don’t find her too annoying by the end, but is still very much herself. The sister I just found to be annoying the entire show. I was happy that Jun Se never turned into a douche. He was nice the whole time, even when he realised definitively that Eun Sung liked Hwan and would never like him. I like to think that he got together with Eun Sung’s friend on the cruise, lol. I totally agree with everything you said. The pacing was fairly good and didn’t drag to the painful point. This was one drama with an extension that didn’t kill it. I loved the refreshing grandmother and how also our heroine wasn’t a girl who needed a man to save her. Sure, she got help from Jun Se, but she also chose to stand on her own feet and pursue her own dreams without Grandmother’s help. It’s rare for that strong of a female character. Yeah, she was never really the evil step sister. Because in the beginning, she was nice. And then, she only became a bad guy initially to protect her Mum, and then she didn’t want to lose Hwan. But she was never really that bad of a person. I was glad at the end when even her Mum acknowledged (well, sort of) her mistakes, and they moved on. It was interesting watching Jun Se in the courtroom. He was struggling so hard to make a decision, and i actually wasn’t 100% who he would choose. I hated his Dad. And the grandmother was such a nice person that she didn’t even call the cops on him for doctoring the books! I would’ve thrown him in jail, pfft.